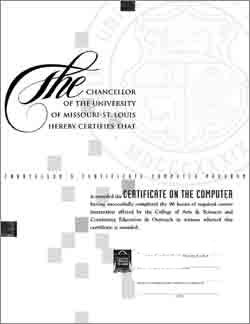 By completing 96 hours of course work, you receive the Chancellor's Certificate on the Computer. This certificate provides recognition for the time and effort you spent to expand your computer knowledge. In addition, Continuing Education Units (CEUs) are offered for participation in these courses and are kept on record at the University. CEUs (one for each 10 class hours) record your efforts toward personal and professional growth. The program is noncredit and no grades or tests are given. One CEU (Continuing Education Unit) is defined as ten contact hours of participation in an organized continuing education experience under responsible sponsorship, capable direction, and qualified instruction. What do CEUs mean to you? Beyond the knowledge and skills acquired through participation in noncredit continuing education programs, CEUs can be of value to you in providing verification of your continuing education experiences to employers, professional associations, licensing boards, and others interested in, or requiring, a record of that participation. How do you receive CEUs? CEUs can be received through participation in noncredit continuing education programs offered by the University of Missouri-St. Louis through the Computer Education & Training Center. On completion of the program, a CEU notice will be presented or mailed to you for your personal files. A permanent record of all CEUs earned for computer classes through the University of Missouri is kept on file.